Conventional gardening tends to use a one-size-fits-all method for growing food. Its central concepts are based on what gardeners want to grow rather than on what plants best suit a particular piece of land. 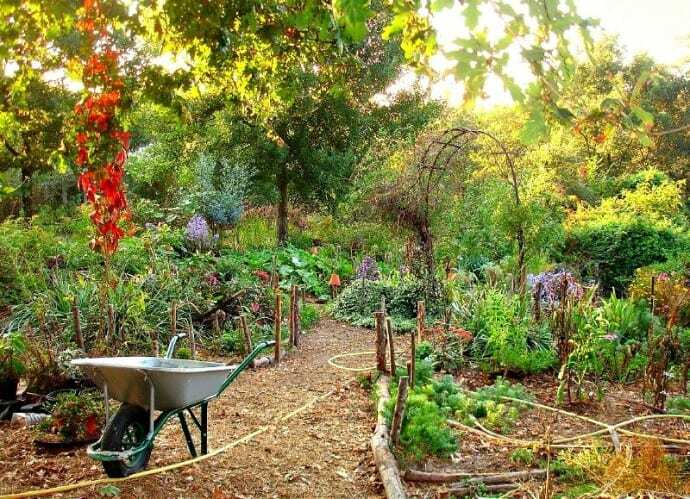 Permaculture gardening, on the other hand, is based on the concept of using the perfect plants for the climate, and utilizing only what works best for the local environment. Dry climates require a different approach than humid climates. Hot climates support different flora than cold climates. Permaculture techniques are incorporated from many different sources, allowing anyone to adapt their permaculture garden to whatever methodologies their plant hardiness zone‘s climate dictates. 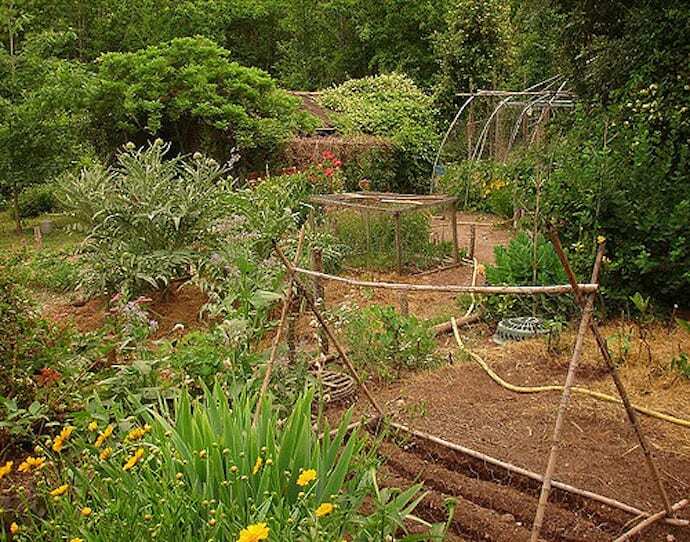 Fortunately, many permaculture gardening designs work well across a broad variety of climatic conditions. 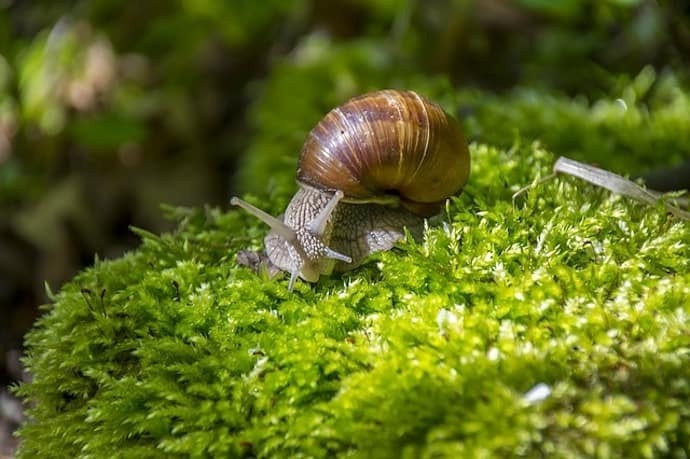 Besides climate, the permaculture philosophy also focused on building up soils to gradually make them more nutrient-rich and well-balanced over time. Soil, after all, is the base from which our food grows. Virtually all of the health benefits that come from growing your own food are literally rooted in having healthy soil. When permaculture systems are designed well, they are intrinsically sustainable and much easier to care for (especially over time). Permaculture gardens create true ecosystems that have built-in mechanisms to constantly revitalize the earth, keeping the plants healthier. 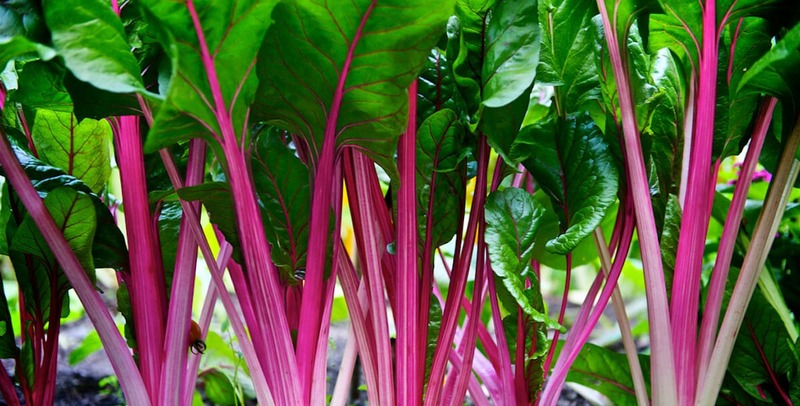 Healthy plants are more resistant to disease and pests, which minimizes labor for upkeep. 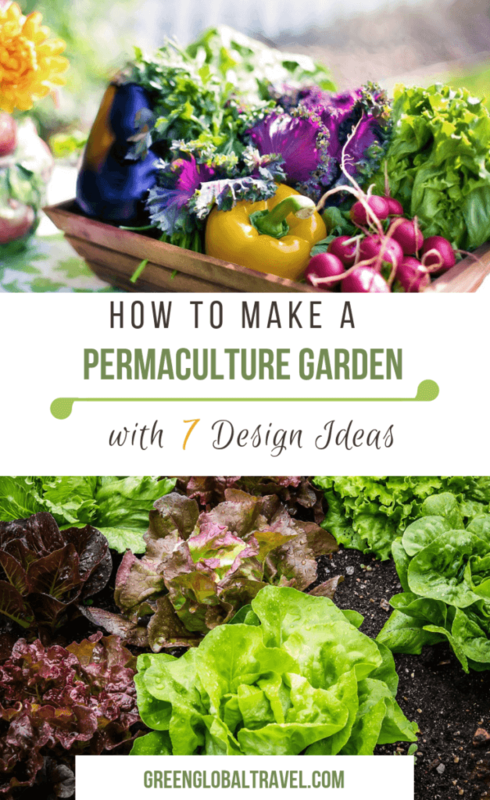 Here’s a deeper look at what permaculture gardening is, how it works, and how to design a permaculture garden that works best for your space, climate, and lifestyle. It was originally coined in Australia by David Holmgren (a graduate student at that time) and his professor, Bill Mollison, who is considered to be the father of permaculture. The two collaborated on the 1978 book Permaculture One, which first introduced permaculture design to the general public. To understand the very basics of the permaculture meaning, it’s important to recognize that all decisions are rooted in three ethics: earth care, people care, and fair share (a.k.a. “the return of surplus”). These ideas guide everything in the chain, from gardens and food forests, to earth works and water catchment systems, to homes and power systems. Permaculture systems are designed to be interactive. For example, roofs are used to catch water that can be used in the kitchen. From there, it drains into gray water irrigation systems. These feed the plants, which in turn provide food and fuel (wood). Each of these elements are then put back into the system as compost. No waste is created. No resources are imported. But it’s also important to realize that permaculture is about much more than a design. It’s a complete shift in lifestyle– a change of approach that ensures that our habits and practices are working in cooperation with (and benefit to) the planet rather than merely taking from and polluting it. Simple eco-friendly ideas such as reusing bags, buying secondhand clothing, and eating local food are also parts of the permaculture mindset. It’s not just a way to grow food. It’s not just about resource conservation and renewable energy. It’s not just a new way to shop. It’s all of these things and more. Permaculture is a rigid system in terms of ethics, but it’s surprisingly open in its approach. Whatever works well for taking care of people and our planet has a place within the practice. This makes a condensed definition of permaculture more difficult than it is in practice. According to most sources, permaculture has roughly a dozen design principles that tend to guide practitioners through a given project. In essence, these permaculture principles are centered around using nature— the most sustainable of all ecosystems—as a manual of sorts for creating productive, efficient, and ecological designs to meet human needs while also caring for the planet. As explained by the co-founder of the permaculture movement, David Holmgren, the principles begin with observing and interacting with nature. This moves into capturing and using renewable energy sources, such as water flows and gravity, and producing abundance while practicing self-regulation. In other words, there are inherent limitations to consumption. Because, while nature can provide enough for humankind, nature also requires resources, energy, and time in order to maintain proper balance. The principles of permaculture acknowledge that, while our yields may be plentiful, success is not measured only in terms of production. Systems must be constantly renewed and cyclical in order to avoid stockpiles of waste and pollution. This can be accomplished by designing in meaningful patterns, in which waste products become assets. For example, kitchen scraps are composted to feed worms. They provide worm castings and aeration to the soil for growing more food. That food eventually provides more kitchen scraps to continue the circle. Designing these cycles requires integrative techniques as opposed to the segregating techniques of factory farming. The different elements of permaculture designs work together, adjusting slowly (as happens in nature) to create stable systems. It’s through natural diversity, a mosaic of plants and landscapes and insects and animals, that stability can be found. Ultimately, any garden design will run into challenges. But permaculture principles ask practitioners to work with these obstacles and adapt strategic methodologies rather than trying to make the same techniques work for everyone, every time, everywhere. Most people are introduced to permaculture in the garden. 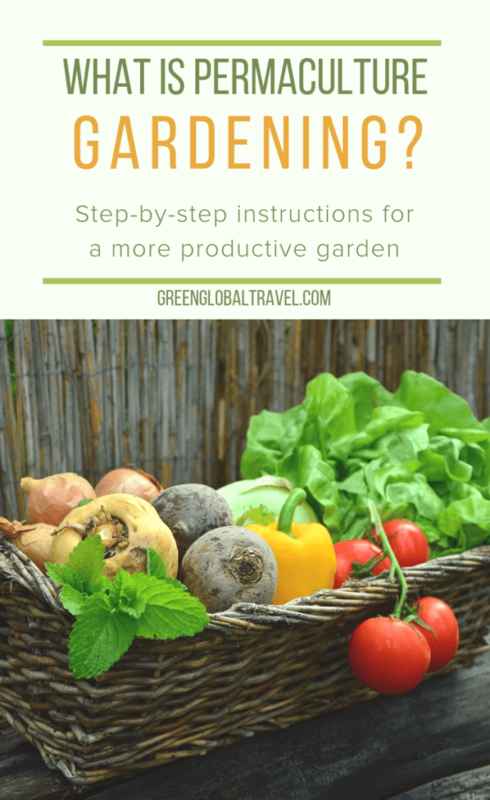 This holistic approach to gardening offers exciting, effective, efficient ways to produce food in small spaces without chemicals and without waste. Instead of using the conventional rows and crops most people picture when they imagine a garden, permaculture garden designs utilize plants and planting methods that are better suited to the specific area and climate rather than striving to grow something that matches poorly with the environment. This approach may mean that not all of the fruits and vegetables shoppers are accustomed to eating will be available in their backyard garden. But it does equate with a more low-maintenance, positive-impact abundance of a wide variety of crops. That means growing local, fresh, organic foods that improve the environment as opposed to chemically derived, internationally imported products. Most of which come from monoculture and factory farms that create pollutants and encourage deforestation. Permaculture designs can be implemented at a mass market scale. But the real crux of the movement is the idea that society as a whole would benefit from moving back towards home garden production, both in rural and especially urban settings. No-dig gardening is a widely applied permaculture technique designed to preserve the soil life that converts organic matter into plant food. When we dig or till, we kill beneficial bacteria, organisms, and creatures that keep the soils in good order. Initially, the decomposition of their bodies will feed the plants in our garden. 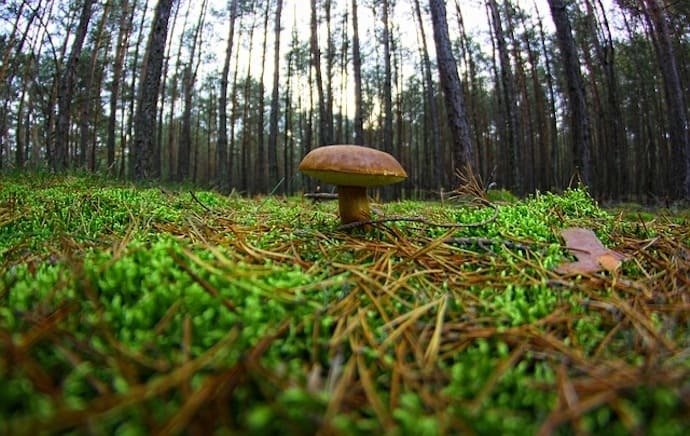 But ultimately, when there’s no soil life left to decompose, the result will be nutrient-deficient soils. Therefore, we should try to encourage soil life rather than deplete it. No-dig gardening beds are built atop existing soil, which has several benefits. Beyond saving soil organisms, the topsoil we’re building the bed on and the soil and mulch we’re using provide a double dose of quality growing medium. For those in humid climates, no-dig beds help to make sure that soils drain well. The use of deep mulches ensures soils stay sufficiently moist, cutting down on maintenance and water use. Popular no-dig methods include raised beds, sheet mulched beds (my favorite), and hugelkultur. Permaculture gardening also emphasizes efficient design, and keyhole beds are a great example. In conventional agriculture, we only plant about 50% of the land we’re cultivating. The raised rows are planted, while the troughs are more or less left to weeds. With keyhole design beds, we’re able to maximize ROI from the space we’ve got for our garden. Keyholes also encourage biodiversity, using mixed planting rather than rows of singular crops (which are more susceptible to diseases and pests). With a keyhole garden, more land goes to cultivation than dead space. This is accomplished by bending a row three to four feet wide around a central point. You’ll want to leave a small access path to that point so that the bed resembles a keyhole. These garden beds can either be harvested from the center, or that spot can be where your compost is concentrated and leached into the raised garden. Because everything is condensed into one spot, it takes less effort to harvest, and we’re using more of our garden for growing plants. Worm Composting or vermiculture is when worms create compost, and vermiculture buckets are a very efficient way of doing this. Rather than having a single compost bin where we put all of our food scraps, we space many small bins (I use 5-gallon buckets) around the garden. Kitchen scraps are distributed into the different buckets, into which composting worms have been introduced. 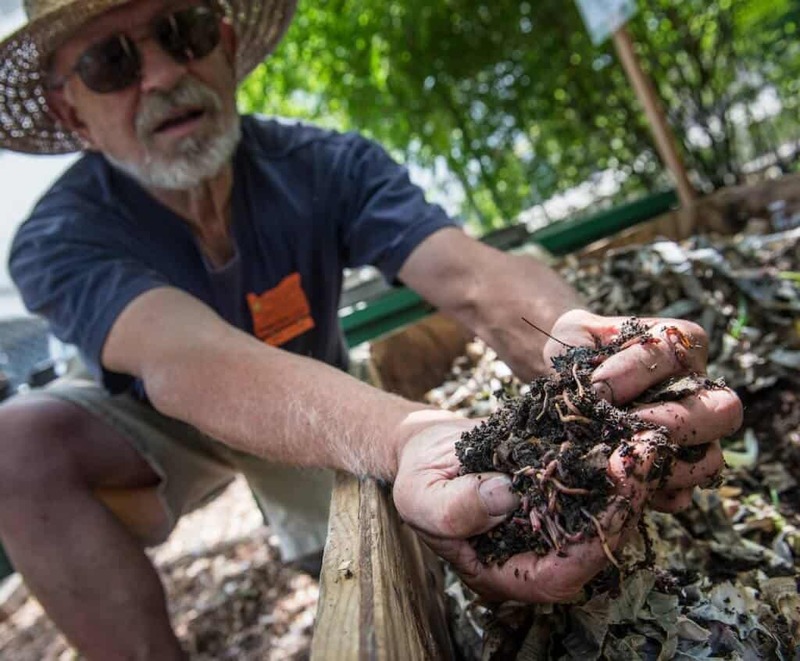 The worms break down the kitchen scraps into worm castings that are much more fertile than typical compost. This permaculture gardening technique works great with both raised beds and keyhole designs. Simply drill a bunch of nickel-sized holes into the bottom half of a 5-gallon bucket. Then bury the bucket in the garden, with the bottom half beneath the soil surface. Then fill the bucket with a bed of shredded paper and/or cardboard topped off with a layer of soil, manure and/or dried grass. Once composting worms are added, they’ll handle the rest. The nutrients of the vermicompost drain directly into the garden and feed the plants. When the bucket is full, the castings can be spread over the bed. Mulching is another key difference between permaculture gardening and conventional gardening, which typically removes all organic matter. Mulch, especially organic mulch, offers a wide range of benefits. It moderates soil temperature by keeping the sun off of it and insulating it from the cold. It prevents evaporation so that the soil stays moist. It stops heavy rains and wind from eroding the topsoil. And, as it breaks down, it reinvigorates the soil with more organic matter to feed on. Chop-and-drop mulch is a technique that doubles up on the benefits. By growing nitrogen-fixing legumes and dynamic accumulators (i.e. plants with deep taproots that pull minerals up from deep in the earth), top-quality mulch material is produced right there on-site. Nitrogen-fixing legumes provide natural fertilizer—nitrogen—while the decomposition of dynamic accumulators re-mineralizes the soil. Because the plants are in the garden, leaves and branches are simply chopped and dropped right onto the beds. These plants will grow back again and again, providing more and more organic matter to constantly improve the soil! 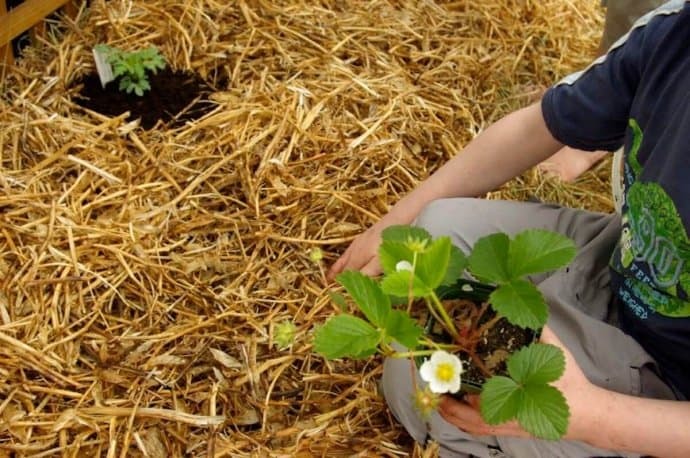 READ MORE: Sustainable Agriculture: Is Will Harris the Future? Biodiversity in the garden is beneficial because the nutrient needs of crops vary. Pests aren’t provided with rows upon rows of their favorite food. And harvests aren’t centered on the success of one crop. Companion gardening ups the ante with pairings in which the individual plants provide services for the other plants in the group. Having chop-and-drop organic mulch plants is an example of this, but there are many other aspects of companion planting. Good plant combinations can help with controlling pests, attracting beneficial insects, filling vertical spaces, and providing fertilization. Most culinary herbs and many flowers, such as Nasturtium and Marigold, are fantastic repellents for garden pests. Flowering plants are very good for attracting bees and other pollinating insects. 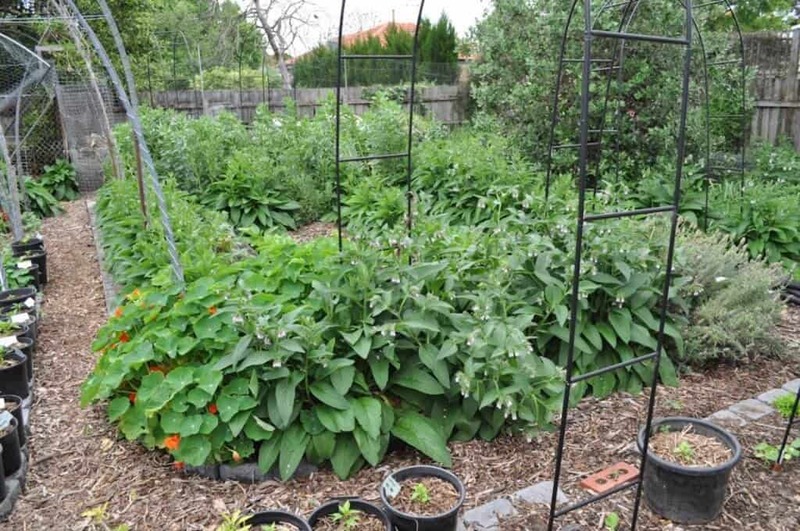 The trinity of corn, bean, and squash are a classic combination of efficiently using vertical space in your garden. The corn grows high, beans use their stalks as poles, and squash winds along the ground. Corn, beans, and squash also have beneficial relationships at the root level, from which each plant’s growth is enhanced. Perennial plants are a huge part of permaculture design because they supply food without needing to be replanted year after year. But that isn’t to say that permaculture gardening plans never include annual plants. 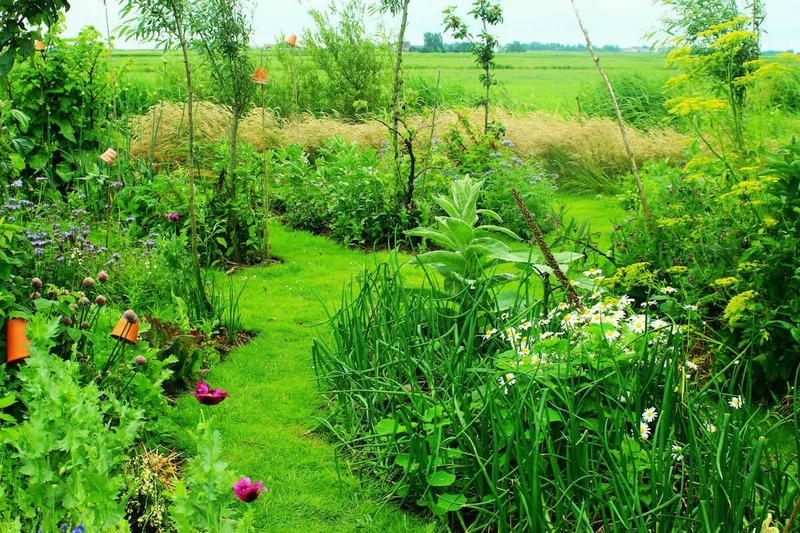 Annuals do have a place in permaculture, but the overall approach is more measured. Growing annuals sustainably requires rotating crops, which means changing the type of plants we are growing each time we cultivate a particular bed. When the same plant (or plant family) is used in the same soil time and time again, that soil becomes depleted of whatever nutrients that plant likes. And diseases and pests that like that particular crop linger in the soil, waiting for the next round of feasting. By using rotational cropping techniques we can create simple sequences of planting that will revitalize the soil and keep pests and diseases at bay. A typical sequence starts with soil-enhancing beans and peas before hungry cruciferous vegetables. 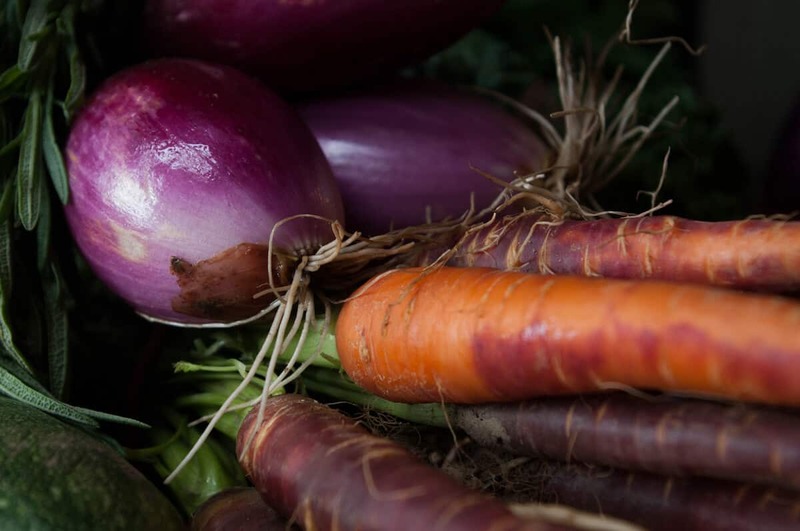 Then you switch to nightshades like tomatoes, peppers, and eggplants, with mineral-mining root vegetables as the last leg. Then, the whole cycle starts over. Permaculture gardening centers on three core ethics: Earth care, people care, and fair share. In terms of gardening, “fair share” means that we can’t constantly take from our gardens without giving back. Conventional agricultural has done this in the form of chemical fertilizers, which is neither necessary nor sustainable. Using fertilizer as opposed to organic matter to feed plants doesn’t help with feeding soil life and building new soils. The end result of this process is completely sterile earth that has nothing more to give in terms of nutrients. 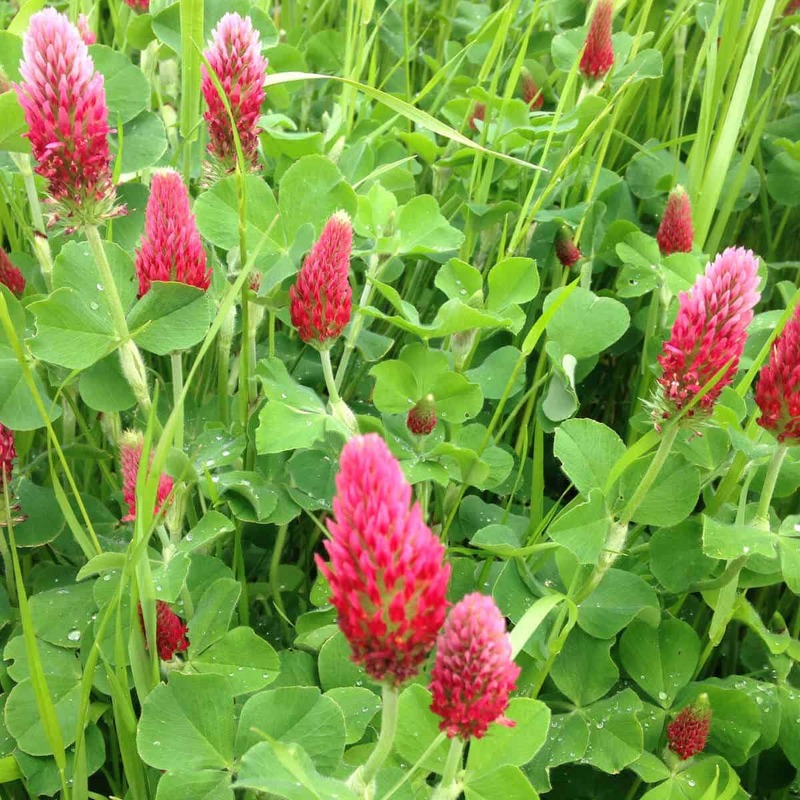 Green manure is another way to give back to the garden. This process involves growing soil-amending groundcovers with the sole purpose of cutting them down and giving them right back to the garden as organic matter. Natural systems work this way: Things grow, die, and go back to the earth so that the next generation can grow from them. If we only ever harvest from our annual gardens, the soil never gets back the energy lost in producing those crops. It’s only fair to our soil to occasionally grow something for it. Many gardeners grow green manure as part of the crop rotation (often after the root vegetables). 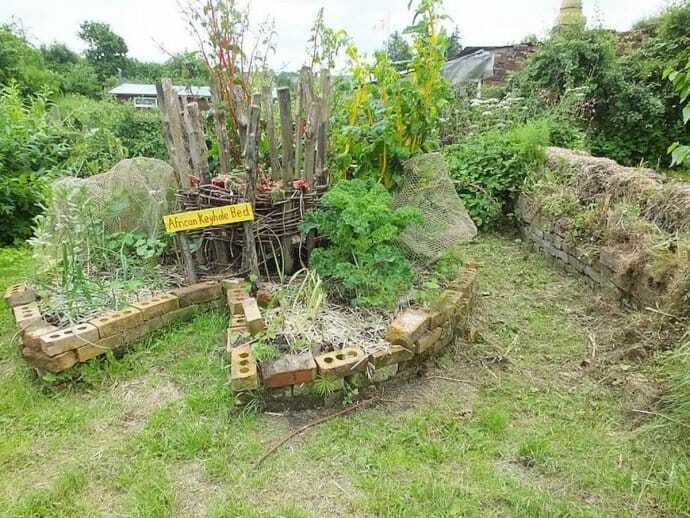 A permaculture garden is a great thing for anyone to involve themselves and their family in. It helps keep everyone active, and encourages meaningful interaction. It’ll beautify the house, and perhaps create a DIY wildlife habitat for bees, hummingbirds, and butterflies in your own backyard. It’ll improve the soil and provide productive avenues for household waste, whether it be kitchen scraps, gray water, or paper products. It’ll increase the local biodiversity, both plant and animal, while simultaneously producing healthy food. Beyond these very admirable attributes, permaculture gardening involves people in their food on a very personal level. Gardens like this will revive the collective understanding of what it takes to produce a carrot or potato or apple, where they come from, when they’re at their best, why organic is more than a label, and how everyone everywhere is capable of contributing to dinner. This is a cleaner, healthier, dreamier way of both envisioning and participating in the future, creating a new Eden of sorts. It strives to create a future in which humans are more in tune with the planet, with each other, and with themselves. 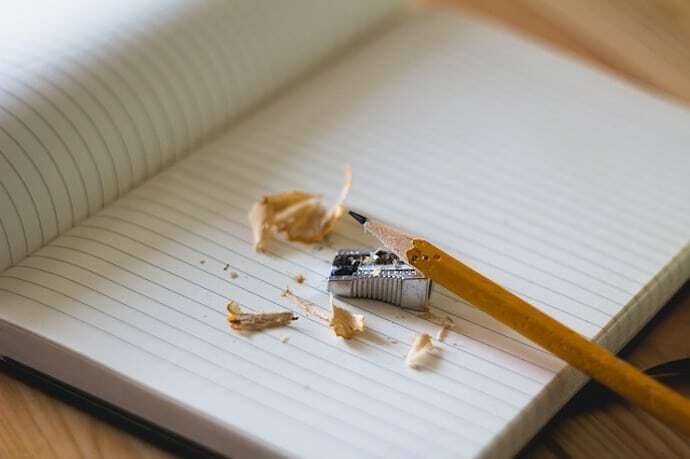 The financially unfortunate combination of travel enthusiast, freelance writer, and vegan gardener, Jonathon Engels whittled and whistled himself into a life that gives him cause to continually scribble about it. He has lived as an expat for over a decade, worked in nearly a dozen countries, and visited dozens of others in the meantime, subjecting the planet to a fiery mix of permaculture, music, and plant-based cooking. More of his work can be found at Jonathon Engels: A Life About.